In Tibetan Buddhism, the life stories of Buddhist masters have always been a source of inspiration. They can serve as examples and show what is possible for a true practitioner. 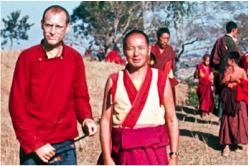 If you have ever been to a teaching by Karuna or Jon, you may have already heard bits and pieces here and there. So you will know that these two evenings will be a treat not to be missed! Suggested donation: $15 per evening. 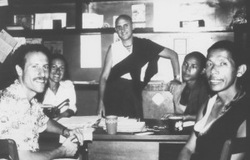 Karuna Cayton, Pam Cayton, Nick Ribush, Thubten Tsering and Lama Lhundrup, Kopan 1981. Photo courtesy of Karuna Cayton. 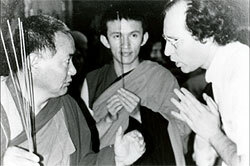 Lama Yeshe ‘instructs’ Jon Landaw while Gonsar Rinpoche looks on.